It’s Friday and it’s cocktail time! I was thumbing through one of our cocktail books this afternoon, “The Modern Mixologist”, by Tony Abou-Ganim. Normally what happens when I’m looking for cocktail inspiration, I come upon a drink that looks absolutely mouthwatering, but then I find that it requires me to either buy an exotic ingredient, or what happens more often, requires an infusion that takes one to two weeks to prepare. So, you can imagine my excitement when the book fell open to reveal a cocktail that was not only easy to prepare, but included everything that I already had in my pantry and refrigerator. I made a small substitution–the recipe called for English cucumber and I only had a good, old-fashioned regular cucumber, but I think the only difference it made was the final presentation. In short, it was tasty and refreshing and perfect for a Friday evening after a long work week. The drink is called the Cesar Ritz Martini and the author created it as a signature drink when he was working with the staff of the Ritz-Carlton to revive some classic cocktails. The spirits used here are Plymouth Gin and St. Germain liqueur, which you may remember as one of the ingredients in the Framboise 75. I have really fallen in love with the sweet, floral flavor of the St. Germain. It’s sweet enough that simple syrup isn’t needed in the cocktail, yet it isn’t cloyingly sweet. 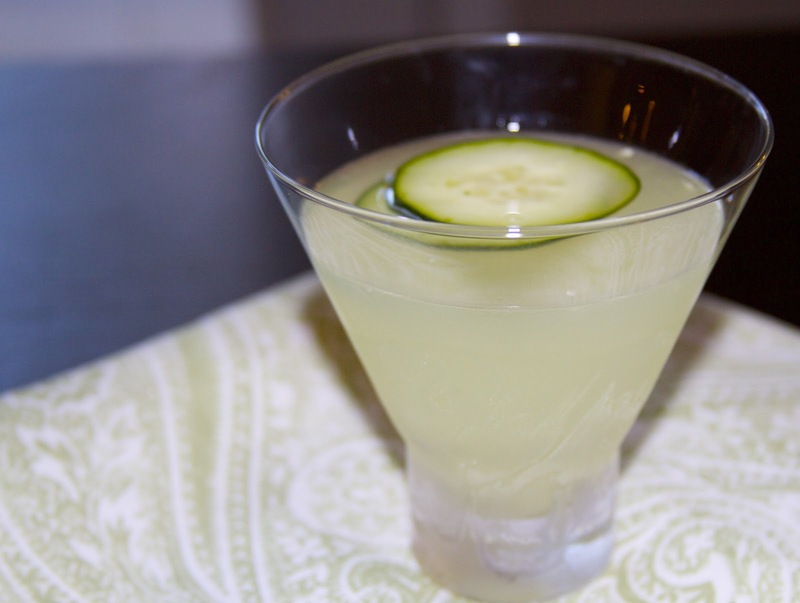 Muddle the mint leaves and cucumber with the St. Germain in a mixing glass (or the glass portion of a Boston Shaker). Add the lime juice and the gin. Shake with ice until well mixed and strain into a chilled cocktail glass. Cheers! Next PostGarden Update: How Does Your Garden Grow?